Dr. Qinya Liu is a professor of seismology and earthquake sciences at the University of Toronto. 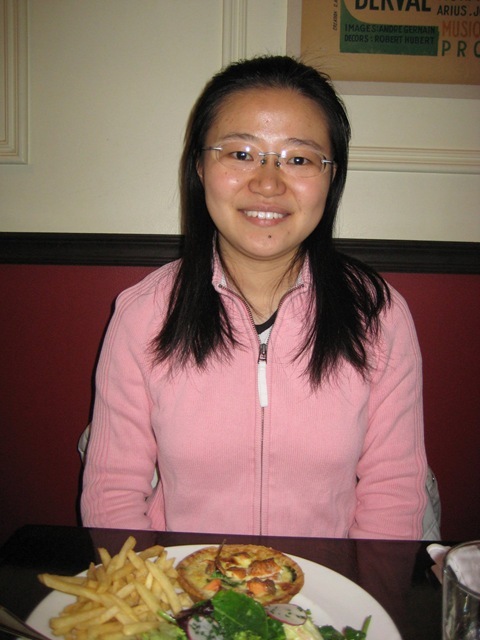 She is originally from China but did her PhD at Cal Tech and her post-doc in San Diego. After the devastation in Haiti, I was hoping to learn a little more about how and why earthquakes happen, what we can do to prepare and whether we will ever be able to predict them. Qinya is incredibly friendly and very good at explaining pretty complicated science in easy language for me to understand. It was a fascinating lunch. We ate at Midi Bistro on McCaul Street in the Baldwin Village area of restaurants. I have never been there before but I will definitely be back. I had the Farmer Salad, which was kind of cheating in the “salad” area because it had bacon in it and was covered in cheese. Qinya had the salmon quiche with a side salad and fries. We both drank water. My salad was so so tasty. I want to eat one again right now. Total bill was $23 with tax. Qinya explained a lot to me about tectonic plates and how it is the fault lines between these plates that are the most dangerous. She explained two pretty interesting things about areas where these plates meet. One that we all know well is the San Andreas fault, which runs through California and it is where the North American Plate meets the Pacific Plate. With these two plates constantly pushing against each other, the Earth is shifting at an average of 4cm a year. This means that in 10 million years, San Francisco will be at the same longitude as Los Angeles. The second area is the Himalayas. This is where the Indian Plate meets the Eurasia Plate. These mountains are caused by these two plates hitting each other and the mountains continue to get higher. Who knew? The devastating 7.0 earthquake in Haiti was caused by one of these major faults. The Caribbean region is actually quite dangerous for earthquakes as the Caribbean Plate meets the North American Plate. The most simple way to explain these quakes, as Qinya patiently and graciously explained to me, is that these plates are constantly pushing against each other and it is not two smooth surfaces rubbing together. Eventually there is a shift. For smaller, in the area of 5.0 earthquakes, that I remember feeling in Ottawa growing up, Qinya says those are from smaller fault lines likely caused by old tectonic activities that cover the entire surface of the Earth. Although these quakes happen, they are less likely to cause the destruction that we are seeing on our TVs a lot these days. In terms of predicting future quakes, Qinya told me that it depends on how you define “predict”. It is still impossible to predict exactly when an earthquake will hit. But there is science and research that can determine areas that are likely to get hit and an approximate timeframe when it is bound to happen. These predictions would be something like “an earthquake of X magnitude is likely to hit Y in the next Z years”. Although knowing this does not help people to be outdoors in the exact moment that a quake hits, it does help to know these possibilities. Qinya explained that in places such as Vancouver that sit between three plates: the North American Plate, the Juan de Fuca Plate and the Pacific Plate, because people know an earthquake can happen, certain building codes are in place to make the area safer. Qinya said that the best way to be prepared in the long term for an earthquake is to build safe buildings, bridges and infrastructure and, in the short term, is to know what to do when an earthquake hits, such as hiding under a table or in a doorway. But there is still so much that is unpredictable, such as where the epicenter of the quake falls and how far below the surface of the earth it occurs. The closer to the epicenter and the closer to the surface – the stronger it is. I might not be able to explain this part exactly as Qinya explained to me, but the Earth is all connected and these movements and shifts travel throughout the Earth. So last week when Haiti shook, with the proper and sensitive equipment, that quake was felt here, and across the globe. This is a big part of what Qinya researches and the applications that come from this. It was really interesting to speak with Qinya and learn so much about something I really knew little about. She has a really great way of explaining things and I want to learn even more. Although our conversation was very much based in science and fact, it’s hard to even find the words for what this “science” is capable of doing. I just want to end off with a quick link to two very worthy organizations – Doctors without Borders and the Canadian Red Cross – both accepting donations to help Haiti, no matter how small, and both doing very important work on the ground.